Tokushima is situated in the north-eastern region of Shikoku. It is the major gateway to the island from Kansai. It is connected via Awaji Island to Kobe. Unfortunately, this city is very small and easily visited within a day or two. You can easily get out of Tokushima city and head to Naruto in the north; Iya Valley in the west; and towards Muroto in the south. Sudachi-kun. An unknown character found at the foot of Mt. Bizan. Tokushima is primarily known for one thing, and only one thing, the Awa Odori. It is a summer festival held in August. It is one of the most distinct and unique festivals in Japan. The Awa Odori is literally a traditional dance of the region. People dress up in the regions unique festival clothing and the dance can be heard for blocks. It is very difficult to describe the dance and it is something that must be seen in video to truly understand how complex, active, and interesting it really is. All over Tokushima city, you’ll be able to see statues, banners, art, and videos of the Awa Odori. You can even take a dance class at the base of Mt. Bizan. 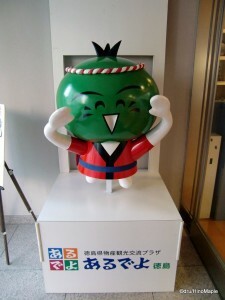 While the Awa Odori is the most famous thing about Tokushima, sudachi is the most famous gift from Tokushima. It is a small green citrus fruit that is similar to limes and lemons. It has a slightly stronger taste, but very refreshing. Beware that buying any sudachi sweets can be dangerous. They last a long time, but once opened, they “could” expire within a day or two. I would recommend buying sudachi alcohol and drinks, which are very popular. There are only a few things to do in Tokushima itself. The most famous thing to do is to head up Mt. Bizan. There is a gondola that will take you from the base to the peak, but it runs every 15 minutes. You can also get a discount if you go in the evening. The top of the mountain is very beautiful and gives you a great view of the city. Heading up in the evening is worth the price, however heading up at full price may not be worth it for those on a budget. You can also hike up the mountain, and the peak offers various hiking paths. If you are an avid hiker, this is a great place to get started for a short day hike. Routes tend to be well marked and wind their way around the mountain. In May, you will also be greeted with beautiful flowers blooming around the peak station. If you are lucky, Mt. Bizan has over 1000 cherry trees, so the cherry blossom season is supposed to be extremely beautiful. After Mt. Bizan, Tokushima Central Park is the next best place to visit. It is located on a hill behind the station. It can be a little difficult to reach as the station has only one entrance, to the south. The park is located north of the station. Once you find the park, it is a very nice place to visit. 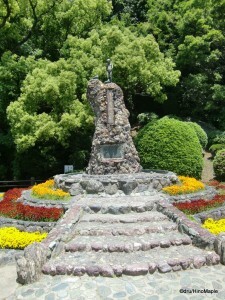 The entire park is the site of the ruins of Tokushima Castle. There are two routes to the top of the hill. While both routes are equally difficult, be aware that the main route may have some school kids running up as part of their training exercises. In all honesty, this park is better served to the locals. There isn’t too much to see. The view from the top of the hill, while nice, isn’t that great. It’s difficult to see much of the city as there are large trees surrounding the old courtyard. However, it is a good way to enjoy an afternoon in Tokushima. 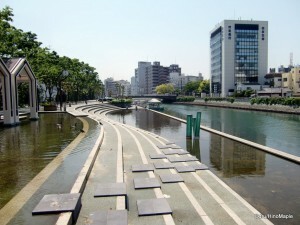 Finally, walking along the Shinmachi River, south of the station, is a lot of fun. The parks along the river are very beautiful, and there is a lot of outdoor art to enjoy. You can even take a boat cruise around the city for only 100 yen. It takes about one hour to go around the city. You can also take a 4 hour cruise up to Naruto. The river is also conveniently located near the main shopping area. Shopping in Tokushima is sparse, to say the least. It is probably the smallest major city in Shikoku, so finding any major name brands would be very difficult. If you are looking for something to eat, I would recommend ramen. It is a local specialty and the local food maps, available in most hotels, show the locations of famous ramen shops. While it isn’t very different from other ramen shops in Japan, they tend to add slices of meat, and the soup base tends to be a little thinner and saltier, in my opinion. Overall, I couldn’t say there is a lot to do in Tokushima city itself. However, there is enough to make it a good weekend trip. If you are just backpacking around Japan, timing a visit to coincide with the Awa Odori is the best way to go; otherwise it’s best to skip this city. I would definitely like to return someday. This entry was posted in Shikoku and tagged alcohol, Awa, Awa Odori, Awaji Island, Bizan, Bizansan, citrus fruit, cruise, dance, gondola, hiking, Iya Valley, Japanese dance, kansai, Kobe, Mt. 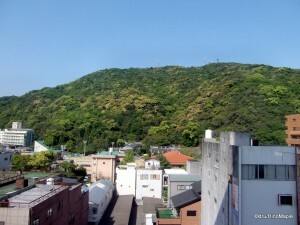 Bizan, Muroto, Naruto, Odori, outdoor art, ramen, ropeway, Shikoku, Shinmachi, Shinmachi River, shochu, sudachi, sudachi alcohol, sudachi shochu, sweets, Tokushima, Tokushima Castle, Tokushima Central Park, Tokushima Chuo Koen, Tokushima Chuo Park, Tokushima ramen, Tokushima-jo, Tokushima-ken, Tokushima-shi by Dru. Bookmark the permalink.